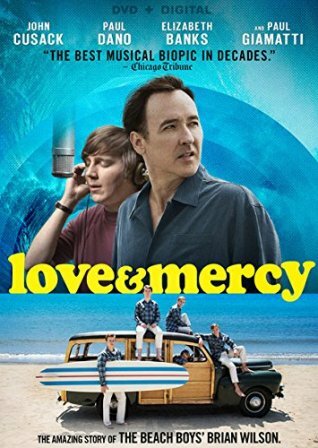 Love & Mercy depicts two phases in the life of The Beach Boys’ Brian Wilson, splitting its time between the 20-something Wilson (Paul Dano) and the 40-something Wilson (John Cusack). We’re treated to the young Wilson as he produces some of the most indelible pop classics of the ’60s, focusing primarily on the sessions that produced the Pet Sounds album. Though he’s plagued by the onset of psychological problems (panic attacks and voices in his head, among them), he’s also flying high on pure musical inspiration. The rest of the Beach Boys are frustrated as Wilson largely casts them aside, opting out of tours and choosing to work with session players. Director Bill Pohlad (Love & Mercy is the sophomore directorial effort for the veteran producer; his first, Old Explorers was issued way back in 1990) moves back-and-forth between the ’60s and ’80s. The older Wilson is an over-medicated mess, helplessly allowing his life to be completely controlled by his therapist, Dr. Eugene Landy (Paul Giamatti). He lives in total estrangement from his family, surrounded by the tyrannical Landy and his team of assistants. Pohlad skillfully draws connections between the Wilsons’ oppressive father Murry (Bill Camp; Brian’s brothers Carl and Dennis Wilson are portrayed by Brett Davern and Kenny Wormald, respectively). Murry, fuming over his dismissal by Brian as manager of the Beach Boys, is depicted as constantly belittling towards Brian. There’s mention made (in both the ’60s and ’80s eras) of the physical abuse Brian endured as a child at Murry’s hand. The intervention of a Cadillac saleswoman, Melinda Ledbetter (Elizabeth Banks), begins to turn Brian’s life around. She’s understandably alarmed by the control Dr. Landy exhibits over his patient and makes moves to wrestle Brian out of the unhealthy situation. 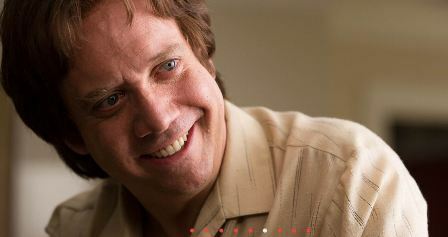 As depicted by Giamatti, Landy is a megalomaniacal bully. The implication is that he’s after the money generated by Brian’s lucrative back catalog of hits, but this angle probably should’ve been played up more explicitly. As the older Wilson, Cusack struggles to fully inhabit the character. Paul Dano, on the other hand, vanishes into his role as the young Wilson. That leads to what is Love & Mercy‘s most prominent weakness. It’s jarring every time we make the leap from Dano’s young Wilson to Cusack’s middle-aged Wilson. Perhaps it would’ve been better to stick with one era or the other, or at least weight it more heavily one way or the other. The ’60s stuff is inherently more interesting anyway, since these were the most creative and artistically productive years of Wilson’s life. Still, it’s tough to compress anyone’s life into two hours and Pohlad and company do a fine job overall. Love & Mercy is a compelling look at one of the most compelling artists in pop music history.